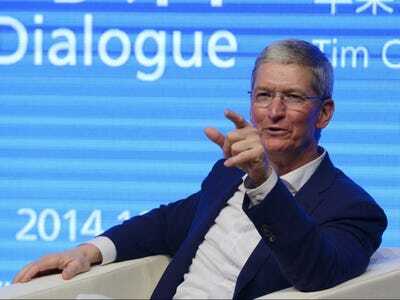 China Daily/ReutersApple CEO Tim Cook gestures as he speaks at Tsinghua University in Beijing October 23, 2014. We’re getting an inside look at the way Apple negotiates with its suppliers, thanks to a bankruptcy filing. GT Advanced Technologies (GTAT) has gone bankrupt, and it’s blaming Apple for the bankruptcy. GTAT incurred losses — resulting in the current liquidity crisis — due to Apple’s inordinate control over GTAT’s liquidity, operations (including control over product specifications), and decision making. With a classic bait-and-switch strategy, Apple presented GTAT with an onerous and massively one-sided deal in the fall of 2o13. Now, this is only one side of the story. And, doing business is often nasty. We’ve reached out to Apple for comment and will update this if we hear back.